Traffic calming measures proposed for the Lagoon neighbourhood in Colwood have not received the required level of support in a survey of residents, and will not be implemented. 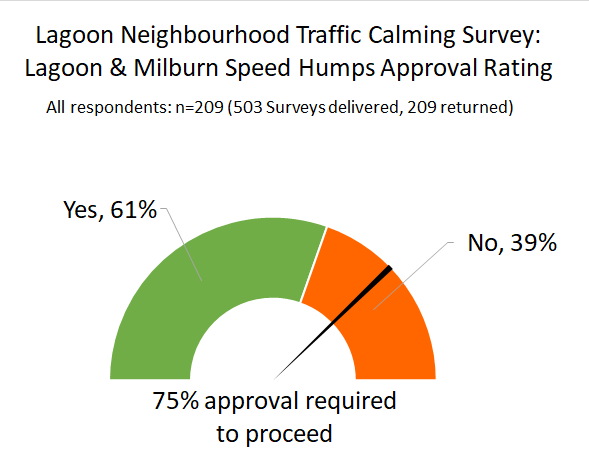 In response to resident concerns about vehicle speeds and pedestrian safety on Lagoon Road and Milburn Drive, the City of Colwood developed an extensive list of traffic calming options, then surveyed Lagoon neighbourhood residents to determine whether there was support for the measures selected by Council. The proposed measures included speed humps on Ocean Boulevard, Lagoon Road, and Milburn Drive, and a possible closure of Hatley Drive at Passage Way. The City’s traffic calming policy requires that residents be involved in decisions about traffic calming in their neighbourhood through surveys. The policy stipulates that for an initiative to go ahead, at least 50% of the surveys delivered must be returned, as an indicator that the issue is important to the majority of residents. Further, of those surveys returned, at least 75% must be in favour of the proposed traffic calming measures. In this case, neither of those thresholds was met. 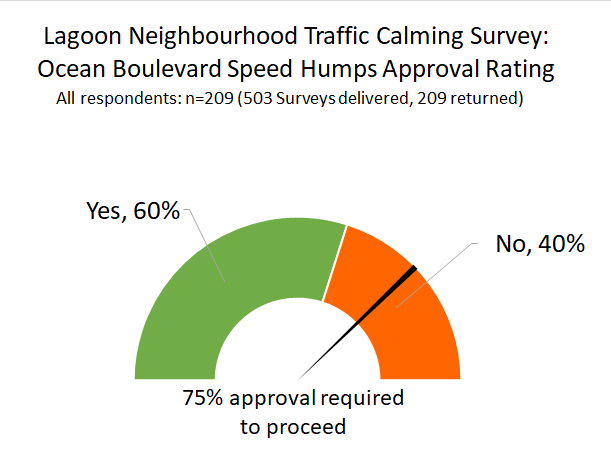 The Lagoon Neighbourhood Traffic Calming Survey had a 42% response rate, and the approval rating for each of the proposed measures was below 75%. The three ‘dashboard’ charts below show the percentage of respondents who indicated ‘yes’ in support of each of the proposed measures. It is important to also note that the 58% of residents who did not respond to the survey compose a silent majority beyond what is reflected in these charts, which the City cannot ignore. Installing sidewalks along the full length of Lagoon Road, and adding a traffic light at the intersection of Lagoon & Metchosin Roads came up frequently in survey responses. Those improvements are planned as part of a development agreement, to be constructed and paid for by the Ocean Grove property owner as that project moves forward. The agreement states that road improvements are required once 262 housing units have been built. Increased police enforcement was another frequent suggestion. While the City has requested greater enforcement in this area, West Shore RCMP has many competing priorities and must allocate officers accordingly. This is something the City has little control over. Residents may request a West Shore RCMP Community Speed Watch for their neighbourhood by calling 250-474-2264. Many comments noted that shortcutting through neighbourhoods may be exacerbated by the 30 km/hr playground zone on Metchosin Road. Speed zones will be the subject of an upcoming engineering report to Council. Several respondents suggested closing Ocean Boulevard, either permanently or during peak travel times, and providing a safer walking route along the Lagoon. Others suggested exploring ways to encourage commuters to use Veterans Memorial Parkway rather than Metchosin Road during peak hours. Upgrades to the intersection of Latoria Road and Veterans Memorial Parkway would be included as part of future development in that area. In response to traffic and pedestrian safety concerns raised by residents, the City installed speed reader boards on Lagoon Road and Milburn Drive in June 2017. The readers flash vehicle speeds as cars pass to encourage drivers to slow down, and they also collect data about vehicle speeds and volumes in both directions. Data for Milburn Road shows that vehicle volumes increase by about 47% on weekdays when commuters use the route as a shortcut. 19.5% of vehicles were recorded travelling at speeds over 50km/hr. Lagoon Road data showed less fluctuation in vehicle volumes between weekdays and weekends, but 66% of vehicles were travelling over 50km/hr. Colwood staff used the data to present an extensive list of traffic calming options to Colwood Council, who determined which traffic calming measures would be proposed in the neighbourhood survey. The survey was distributed by mail to 503 homes on streets below Metchosin Road, between Gratton Road and Royal Roads, to gather feedback from residents who would be most directly impacted because they must use the proposed routes to access their homes. The timeline below gives an overview of the steps taken in this traffic calming initiative. For more background information, please visit www.colwood.ca/LagoonTraffic. Like most municipalities, Colwood has a Traffic Calming Policy that ensures residents are included in decision making about traffic calming initiatives proposed for their neighbourhood. In July 2018, surveys were sent to addresses in the Lagoon Neighbourhood to determine the level of support for the proposed traffic calming measures shown below. Homeowners had the option to respond in paper form or online by July 27, 2018 (one survey per household). Per the policy, at least 50% of households surveyed must respond, and at least 75% of responses must support the measures for the project to proceed. 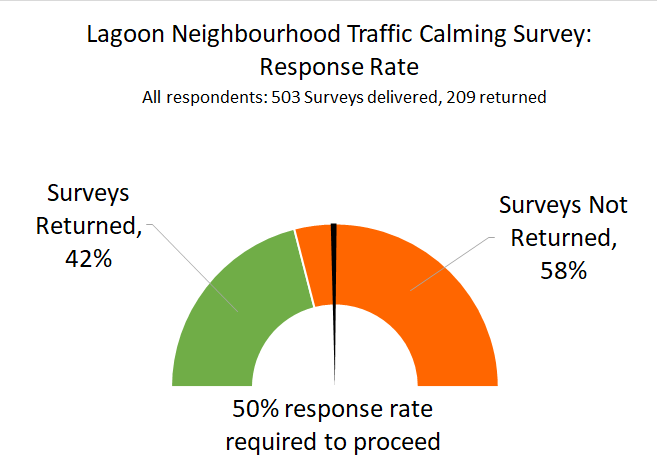 The results of the Lagoon Neighbourhood Traffic Calming Survey will be shared when all responses have been tabulated. 1. Why did the City survey residents about this traffic calming initiative? In December 2017, Colwood Council approved a Traffic Calming Policy intended to provide consistency in how and where traffic calming is implemented in the City and to involve residents in decisions about traffic calming. 2. Who could complete the survey? Surveys were mailed to residents of the Lagoon Neighbourhood, and the survey could be completed in paper or online. For this survey, the Lagoon Neighbourhood included homes in the area below Metchosin Road between Gratton Road and the Royal Roads property. Only one survey was permitted per household address, as outlined in the Traffic Calming Policy. 3. Why was the survey only open to Lagoon Neighbourhood residents? The intention is to gather feedback from residents who are directly impacted because they must use the affected routes to access their homes. 4. Why didn’t the survey come out sooner? On May 7, traffic calming options were presented to Committee of the Whole. On May 14, Colwood Council directed staff to investigate implementation of the specific proposed traffic calming measures. Time was taken to determine and map exact locations, considering many factors including transit stops, driveways, and road grades. Staff also assessed specific types of traffic calming devices as well as procurement and installation details, before developing and delivering the survey on June 27. 5. Why was the survey done during the summer? As noted above, Council direction in May resulted in the survey being ready in late June. Residents speaking at Council meetings expressed a strong desire to see action on this initiative. The survey was open for one month, and the online option allowed people to complete and submit the survey even if they happened to be away from home. On May 14, Council directed staff to investigate installation of speed cushions on Lagoon Road, Milburn Drive, and Ocean Boulevard, as well as the feasibility of closing Hatley Drive at Passage Way. The next step will be to develop draft design concepts and survey residents to determine the level of support for these measures. In response to resident concerns about vehicle speeds on Lagoon Road and Milburn Drive, City staff collected and analyzed vehicle speeds, counts, and traffic patterns in the Lagoon neighbourhood between June 2017 and March 2018. The data was used to develop and bring forward for discussion several traffic calming options and the implications they would have for the neighbourhood and the City as a whole. Read the details in the Traffic Calming Options and Implications for the Lagoon Neighbourhood. Council will consider the options and implications at the May 7 Committee of the Whole meeting. Colwood staff have been compiling and analyzing the data from the speed readers on Lagoon Road and Milburn Drive. This data will be made public, and will be included the traffic calming survey that will be mailed to residents in the area this spring. During the spring of 2017, the City received a number of concerns from residents of Milburn Drive and the surrounding neighbourhood about traffic volumes, speeding and pedestrian safety. There are several things that make traffic flow in the lagoon area unique. Ocean Boulevard is within an area designated as open/park space with specific environmental considerations, and yet the surrounding streets are used for both local access and commuter vehicle movement. This dual use can create challenges. Explore options for synchronizing the timing of the traffic lights along Sooke Road and Island Highway with the goal of improving traffic flow on major routes and reducing the number of vehicles on Milburn Drive and Lagoon Road. On Friday, June 30th, two speed reader boards were installed — one on Milburn Drive and one on Lagoon Road. These reader boards collect traffic data, including the date, time, speed and number of vehicles passing by. This information will be analyzed and used as benchmark data for a new Traffic Calming Policy. The results of the data collection will be shared publicly. The speed limit on these roads is 40 km per hour. The reader boards will display vehicle speeds up to 50 km per hour, and then go blank. This is to discourage immature drivers wanting to 'test the limit of the reader'. Actual speeds and vehicle counts are tracked even when nothing is displayed on the reader board.